Today it has been announced that if you are using the Wheezy image of Raspbian you can update to allow dynamic overclocking without voiding warranty. I’ve been using my Raspberry Pi for a little while now and have begun to notice the CPU limitations when compiling code and performing other tasks so I jumped at the opportunity to give this a go. I’ll briefly go through the steps I went through in order to update the OS, as well as provide a basic benchmark that will display the changes. 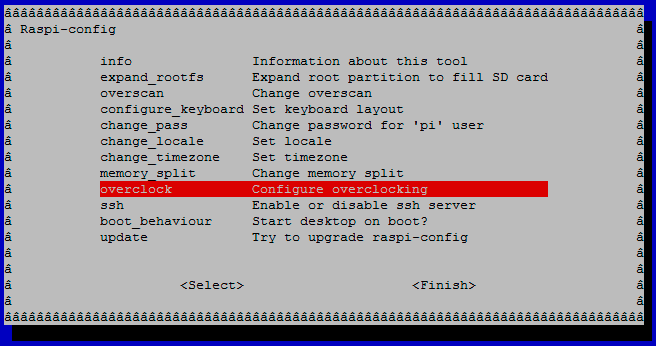 You can either upgrade your current software versions, or alternatively you download the latest version of the Raspbian image which is up to date with everything already. I had not upgraded my Raspberry Pi since my original installation so this process took me quite a while. As I’ve never done any form of updating I needed rpi-update so I could update firmware. After this I tried to run rpi-update, but found that I needed to first have GIT installed. No problem, I installed GIT and then proceeded with running rpi-update once. Once running this you will get the below menu, navigate to overclock with the arrow keys and press enter. Next you will be given a warning about overclocking, after that you will be presented with the 5 levels that you can overclock to. 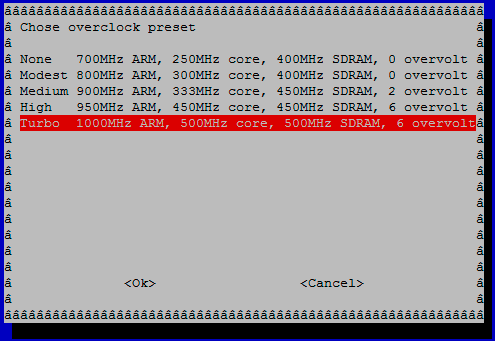 Note that every time you change the overclock preset you will need to reboot for it to take effect. The current benchmarks I have performed were done using this Python script which calculates all the prime numbers up to 1,000,000 – a task that works the CPU quite well. I’ve run the test 3 times at each overclocking preset level so that you can get an idea of the difference in performance between the 5 levels. Here is the above data in a graph. 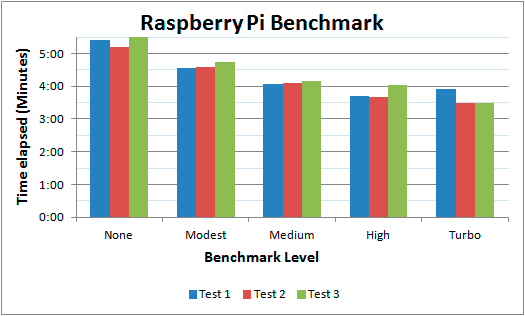 As you can see the overclock is performing much better at the simple test I have performed, I have also noticed when using my Raspberry Pi normally that everything feels much smoother which is great. If you’re interested in the Raspberry Pi you can pick up a kit from Amazon fairly cheap and get started! I see that some of your tests seem to increase in execution time with the 2nd and 3rd iteration. Do you believe this to be due to heat increase and the dynamic over clock adjusting itself? It very well may be, at the time I didn’t monitor the temperature. I did however reboot after each set of 3 tests in order to apply the overclock preset which could have allowed time for it to cool down. I was thinking along the lines of performing more than one test just so that I could get a more average set of results. I’ll try the tests again when I get some time and monitor the temperature to see if this factor is skewing the results. Alright so I ran the test again at 1GHz in the exact same way I did the first set and the temperature never passed 45c. During this time there was no idle CPU.